During the weekend, I found some smaller than usual persimmons which are one of my favorite fruits from early childhood. To my surprise, they are as sweet as the larger ones and I decided to carve one to included with Nikolai's lunch. He is not a huge fan of persimmon and I am hoping he will give this small one a try. 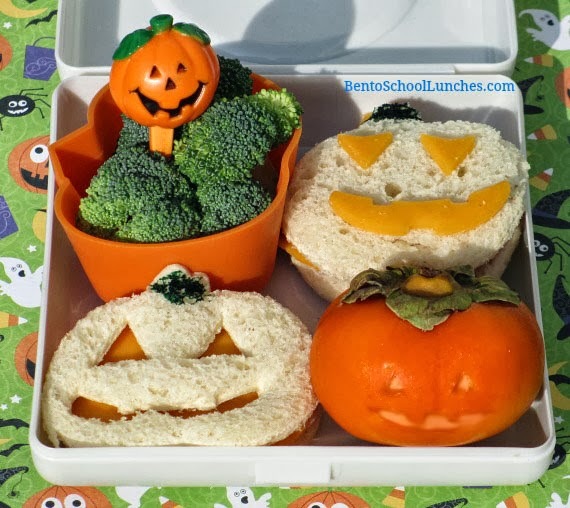 Jack-o-lantern sandwiches, one with features cut out, the other with them added. Food safe marker stem. Small Persimmon carved as if it were a pumpkin into a Jack-o-lantern. Broccoli florets with Jack-o-lantern pick in silicone pumpkin cup. This lunch is packed in a Fuel lunchbox. Love how you carved the persimmon! Love eating those!